For several years, I've heard about a mysterious technique for language learning called shadowing. I understood that it had to do with repeating after a recording of a native speaker, however, I didn't really know more than that. But recently I've become more interested! It all started because I want to improve my Polish pronunciation. While its strongest proponents assert that shadowing is a complete language learning technique, many people say that it's particularly great for improving pronunciation. So, I've decide to experiment using shadowing with Polish! In this article, I describe my plan for this experiment. I'm completely new to the technique, but I know that many readers of the blog already use it. Please give me your advice! Read more for a short explanation of shadowing and my plan! First of all, it's difficult to find a good, concise description that really defines shadowing. This article is one of the best, but I didn't really understand it until I watched this 55 minute video by Professor Arguelles, the creator of the method. Recordings of continuous narratives in the language you are learning, without pauses or instructions in your native language. A transcript of the recordings, given in bi-lingual format: where one side of the page has the text in the language you are learning and the other has a translation in your native language. Professor Arguelles recommends the Assimil courses. The method involves listening to the recording while speaking aloud, imitating what you hear as quickly as you can. You do this in a series of stages: first, without looking at the text (blind shadowing); next, in various combinations of looking only at the translation to looking at both the translation and transcript; and, ultimately, while only looking at the transcript. This is all meant to be done while walking quickly and purposefully, with good posture, preferably outside. The professor doesn't know exactly why this helps, but he says the physical aspect is very important. After "shadowing proper," the professor recommends comparing both versions of the text to study the grammar, as well as various exercises. For example, reading the text aloud, writing the text, typing the text or reviewing it in other ways. It's a very complex method with lots of stages and components! But how much of the method should I follow? The professor states several times in his video that you should start by following his method exactly before modifying it for your needs. However, as an advanced learner, I don't think the full method is appropriate. For example, there is a lot of repetition built in. However, I can listen to an audio book in Polish and understand it without needing to repeat anything. Repetition would just be boring. Also, I don't think a translation is necessary. Most of the time I can guess any unknown words from context. I only very rarely need to look up anything in the dictionary. Every day, I will walk in the park listening to a recording of Quo Vadis, which I am reading right now. I will repeat after the speaker as quickly as I can, trying to imitate their pronunciation. Since it sounds like a difficult skill to master, I will start with 20-minute sessions. I will listen to each part just one time. I'm not sure if I should use the text or do blind shadowing... What do you think? Does my plan look OK? Do you think I will get the benefits of shadowing? How should I change it? How long before I should expect to see any results? I will wait for your input before starting my experiment! I think Quo Vadis isn't the best for you because it isn't contemporary Polish, so you will improve quite obsolete Polish. I know a bit similar method - Effortless English by A.J. Hoge, especially very good set of mp3 and pdf called Power English. It is not only repeating but also asking simple questions. Walking or other physical activity is important part of learning, because it gives to our brains more oxygen ;-). Mr Hoge explains in very detailed way a lot of psychological tricks that make language acquisition more effective. He is very successful ESL teacher, but I'm sure his ideas can improve learning of any language. I have already read more than 30 books (I lost count a long time ago!) in contemporary Polish, so I don't think it will cause any problems. :-) That, and I'm just interested in this book. So far I like it a lot! I read a little bit on Mr. Hoge's website. Looks very interesting! I look forward to learning more about his method. Thanks for the pointer! I'd say my pronunciation is passable. People usually tell me, "Your Polish is really good! Except your pronunciation could use some work." :-) And honestly, it's always been "good enough" so I've never really put any effort into it. That does sound like a great method! Unfortunately, I don't know any native speakers of Polish here in Milwaukee. So, I'd have to work with someone over Skype and the sound quality could be an issue. I've been reading your posts for the last couple of weeks and I really like your site and the BiblioBird project, it reminds me of a site I used to use called Lingro. I personally highly recommend shadowing to advanced learners, it's a great way not only to improve your pronunciation but to improve your diction in general and to target certain vocabulary and grammar. I used it extensively for German when I was preparing for the interview for my current translator job. I don't speak Polish but I've learned a bit in addition to Russian and Czech and you speak it quite fluently, respect. I thoroughly enjoyed your video on how you used Harry Potter to learn Polish. From your blog it looks like you are an avid users of LingQ, as well! BiblioBird, Lingro and LingQ all fall into the same class of language learning application along with Word Champ, Vocabull, Poliglot Project, Lingapp, etc. While there are differences, I think we can agree that this type of tool is very useful. Your blog looks really interesting! I haven't had a chance to read anything too deeply but I've subscribed and look forward to reading more in the future. Mandarin is another language on my "to learn someday" list. :-) There are so many interesting things to learn in this world, yet unfortunately, too little time! How do you use shadowing as an advanced learner? Do you really repeat the same bit of content several times? What do you use as your source material? In the beginning, I listened to the same material many times. But as an advanced learner now, the repetition for me is just boring. I've recently gotten some good advice about shadowing. Grzegorz Łobiński of various language blogs and Vocabull fame advised me that repetition in shadowing is very important. So, I shouldn't try to do it with new content and that maybe I should seperate when I am using content to understand it versus when I'm using content to shadow. Hi, I've been also studying German. Would you be able to give me some clue concerning some materials used in shadowing for that language? I'd like to test this method. On every page, there are short samples of recordings. I'll let you know what I choose and how it goes! 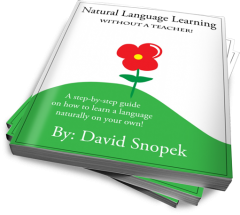 David Martin is right "it's a great way not only to improve your pronunciation but to improve your diction in general and to target certain vocabulary and grammar." - Your polish is very good and you know it. But it isn't perfect yet. Shadowing will help you to improve everything. Grzegorz is also right -repetition in shadowing is a very important part of this technique. At this point, I'm not as worried about being bored. Because now I'm thinking of shadowing and just plain listening/reading as two seperate things. The content will probably only be interesting on the first repetition, but I'm hoping, the act of shadowing will itself be interesting! I plan to focus on the sounds and saying them. The repetition might help me remember more of the new words too! Usually, the first time I meet a new word, I don't remember it right away. I either have to meet it again in an other text or make a flashcard for it. I think it's great, maybe even better than original. według mnie jest jeszcze jedna kwestia jeżeli chodzi o wymowę tj. SŁUCH. Jeżeli ktoś go nie ma, to nigdy nie nauczy się mówić tak jak obcokrajowiec. Dla mnie 2 rzeczy są podstawą czyli słuch oraz ćwiczenia (powtarzanie zdań bądź poszczególnych dźwięków). Zgadzam się: słuchanie jest bardzo ważne w nauczeniu się dobrej wymowy.